A lot of new experiences to share with those who have faith ! Today we picked up a beautiful Silver Toyota from the rental. We could not have picked a better day, since the weather was beautiful. What was not glorious though was that the place was all closed for the Sanfransisco Gran Prix within San Jose. With Parag as the navigator we managed to drive from SanJose to Sunnyvale near the Indian resturant area. We lunched at Lucky da Dhabba and shopped at the Indian shopping joint Cash and Carry (sounds too cliche). The Car would not start when we tried after lunch. The battery was totally dead. The reason for the drained battery can only be due to the headlights or something which was accidentally turned on. Finally we met Giri who saved the day and jumped the battery by plugging the jumper cables to his car. This was after asking a couple of people for help outside the shopping mall. For me it was Gods grace to finally make it back to the hotel with the vehicle instead of calling the mechanic shop. A bunch of us drove to Malouli railway station which is close to Lonavla. On the way we made a memorable stop at Sher-e-punjab for breakfast. 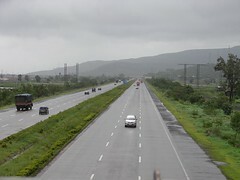 The stop appears a few kms after Hinjewadi Bridge (a highway resturant & bar ). 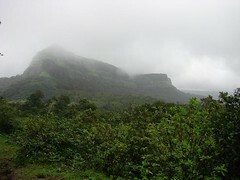 The travel time to the village at the foothills (Bajra) of Lohagad was approximately 1:45 mins (including our pitstop). 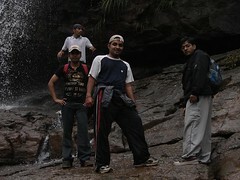 As soon as we parked our vehicles at Bajra, we attacked the first waterfall with full enthusiasm. Reminds me of the trip to the waterfalls at Chennai border. We made the trip after our first Intranet launch. Scaling the waterfall was fun, considering my shoes kept slipping on the rocks (Note:Wear shoes with strong grip). Arif,Kiran, Ravi and Rohan all managed their first rush of adrenalin. By Gods grace, We managed to climb up and down 2 floors like pros i.e. s/w pros. The trek begins ... We are 11 nuts about to embark on a lifechanging experience. At last the trek is over , our lives are changed. The Lethargy syndrome begins when work is aplenty and the thoughts move faster than the fingers that fly across the computer- then how i wish i could just sit back and be the gadget freak to record my thots that get converted into text into a ready made format that I wish for.